So of all the plants flowering at the Mt. Cuba Center yesterday, Fernleaf Phacelia, Phacelia bipinnatifida, seemed to be the winner with honeybees. That's not to say I saw a lot of them there, but rather that's the plant they found. Now, their gardens are in the middle of a wooded area, so whatever hives these bees were from are likely finding flowering trees first and the wildflowers second. 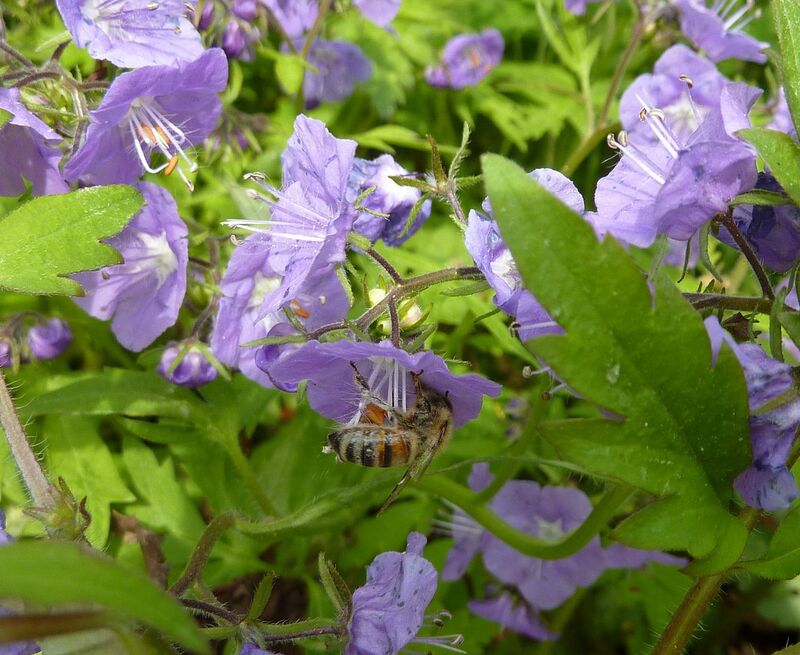 I believe that if someone were to put a hive somewhere in the gardens, rather than on an adjacent farm, that we'd see even more honeybees working their plants, and even more on the Phacelia especially. That said, honeybees aren't exactly beneficial to nature. They typically out compete the native bees, but that's a fairly broad statement. In the springtime there's almost too much for honeybee hives to pick of so there's plenty of food for native and nonnative bees. But if there's a native bee species that can only pollinate one or two species of plants (often something rare, endangered, or picky about it's growing conditions) and honeybees work it first, then yes that's a bad thing. Over the summertime flower selection becomes more narrow as most trees have already flowered for the year, and spring ephemerals have started setting seed to go dormant. Arid climates are another issue and make honeybees look so much worse because native bee populations tend to be so much more diverse there as they've adapted more closely to the desert plants and their bloom cycle. So introducing a hive of honeybees can be a detriment to the environment. What was found in a recent study though, was while honeybees do come in and steal all the food, they were still pollinating the plants (I'm sure in most cases but not all), and in the course 4 to 8 years young saplings and patches of new plants of whatever they were working started to flower. Honeybees don't typically bother with small trees, or small patches of flowers, they'd rather point out the bigger ones and stick with that. So the native bees suddenly had a source of food they could use and their populations recovered some. It's just the initial hit of adding a hive (or a truck load of hives) takes a serious chunk of nectar off the table for indigenous species. I believe that by planting native plants, we can feed the native bees, support more biodiversity, and still produce a honey crop. 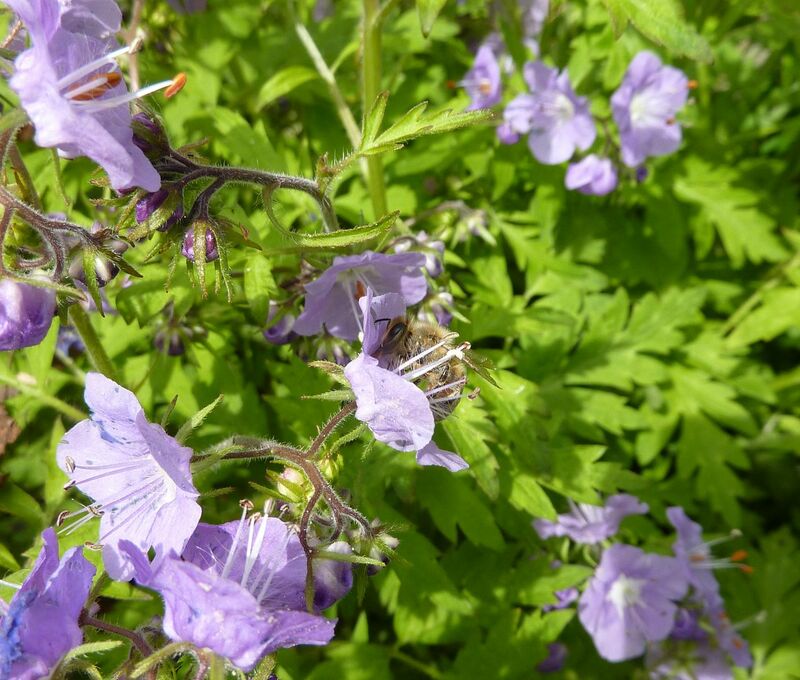 Which is why I was so thrilled to see the Native Plant Sale down the road was selling Fernleaf Phacelia, and I had to buy some! Hopefully they'll go to seed, I'll have more to transplant and grow, and maybe in a few years I'll have a yard that looks as amazing as the Mt. Cuba Center.